I'll let the folks who presented this album explain the content of this project, but I'd just like to add that Rashid Hadee is one of the most slept on producer's in the game and I'm very confused as to why this is. Anyways, do yourself a favor and download this album, after all it is free so what have you got to lose? 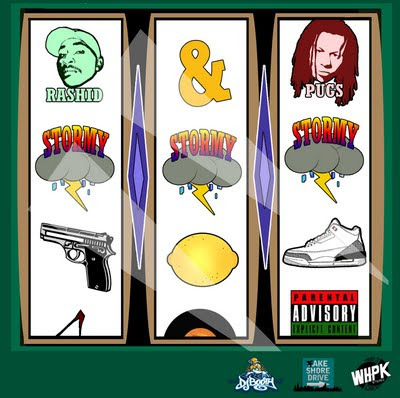 Pugs Atomz and Rashid Hadee have forged their individual paths and together look to establish a new mark of excellence on the DJBooth.net and FakeShoreDrive.com Presented Stormy LP. Stormy blends Hadee’s soulful interpretations along with Atomz evocative lyrical imagery to create an elemental integration that juxtaposes humor and intuition. Hadee and Atomz meld their unique and acclaimed styles to reign their own brand of musical understandings of love, life, and hip-hop. Guest vocals are kept to a minimum (Von Pea drops in on "Hand on the Bible") and the production is handled mostly by Hadee, with help from Grant Parks, Race, Hakeem, Fathom 9, Ram Nation, Tall Black Guy, and Duro.